Tesla just wrapped up its investor's call following the release of its Q2 earnings report, and as always, Elon Musk and Co. delivered a slew of interesting tidbits and quotes. Here's what you need to know, in easily digestible bullet-point form. Musk predicts that the Model X will outsell the Model S by a significant margin, and expects 1,000 units a week of each to be rolling out of its Fremont, CA factory when production ramps up. 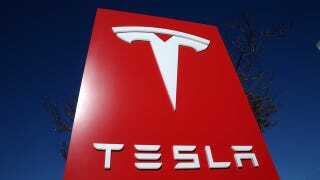 Tesla brought in Formula 1 "people" to optimize the process at its service centers. "A team attacks it," says Musk, with multiple people working on the car at once to get it in and out as quickly as possible. When asked why Musk is so down on hydrogen he said, "If you take a theoretically optimal fuel cell car and compare that to a current, in production battery electric car on key metrics… it's a loss." J.B. Straubel, Tesla's CTO, went on to say that "[hydrogen] does not make a lot of sense" and that building out the infrastructure is substantially more expensive compared to electric. Tesla completed the pad for the Gigafactory outside of Reno, Nevada. Work is still underway and "we're going to be doing something similar in a couple of other states because it makes sense to do things in parallel," says Musk. As for the state's themselves, Musk says, "Tesla isn't going to go for a deal that's unfair for the state or for Tesla… The ball is in the court of the governor and the state legislature." Tesla is getting a lot of interest in the X, but when a customer walks into a Tesla store to put down a deposit, they try to sell them an S.
Samsung and Tesla are working on improvements to the battery chemistry and the cell geometry to improve energy density and reduce costs. The cathode and anode system it's working on is a next generation design that – according to Straubel – will provide a 10-15 percent increase in energy density. With the scale of the Gigafactory, the estimated savings on batteries of 30 percent is conservative. Regarding the issues with the Edmunds long-term Model S, Musk reiterated that it was an early production model and most of the kinks have been worked out on cars sold in the last year. He said that swapping the four drive units was for expediency and is a standard practice at Tesla, because it takes more time and effort to go through the entire unit, identify the problems, and then fix the offending parts. Musk also says that the service team was "Ultra-proactive with the Edmunds' car," implying that there might have been more work done to the vehicle to keep them happy. Since the introduction of the Model S, Tesla has apparently been refining the design to make it lighter, and Musk claims that compared to the earlier versions, the Model S today is a few hundred pounds lighter. We're investigating that further. And to the questions about the increase in investment, Musk simply said, "We're not showing all our cards."